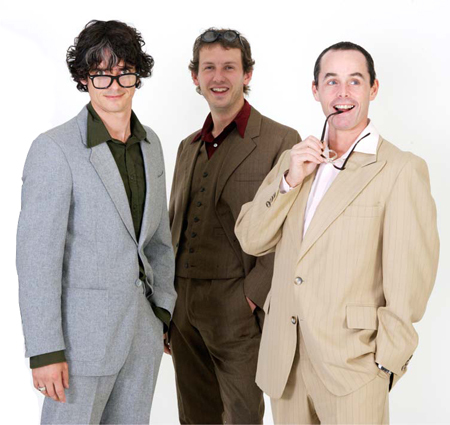 The Outwits comedy company offer one of the most experienced off the cuff and scripted comedy troupes in Auckland. This is a sure fire tailored comedy for an adult audience. Honed from many years of performing before corporate crowds throughout New Zealand, Australia and the Pacific Islands they know what works and how best to leave your guests wanting more. at the 2008 International Comedy Festival. Pierre and Pedro are two flamboyant Europeans, whose goal in life is to give people the best time possible. Together they are the Hausts with the most (hair that is)! They meet and greet the guests as they arrive, making them feel welcomed and entertained. 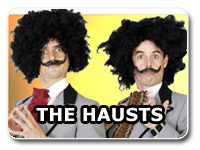 The Hausts will research your company and present an overview in a hilarious non-PowerPoint presentation. This is where they forget their laptops, and have to present the slide show using their bodies, their wits, and a little help from the audience. This show is our signature piece. All singing, all dancing, all maracas. "Señors & Señoritas! But mostly the senoritas. DOS GRINGOS!" 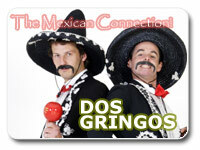 Two typical lads from Westport who were raised as Mexicans. In one night they will teach you everything they know about Spanish culture - they will sing songs, fight sheep, tell myths, shake their maracas and make you laugh until taco comes out your nose. Developed in the comedy clubs around New Zealand, this show is perfect for your next corporate event! Arty and Farty Roaming character hosts with purpose. Be it an Art Gallery, stately home or wherever your function is, their job is to show you around & tell you the "history"... well, their version of it anyway. This show is an ideal option to use as a crowd warmer at the beginning of any lunch or dinner function. Fantastic for getting conversations started. 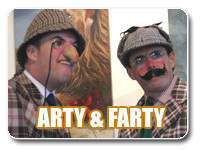 Let Arty & Farty welcome everyone and show them around while you either relax or focus on the next part of the schedule. Roving comedy actors to keep your guests in line. These serious jokers will "Upsize" any corporate engagement. Conference MC’s The Outwits Comedy Company are with you all the way! Our performers are very versatile and can MC your conference as a multitude of characters. Linking all the events together with our own brand of fast paced comedy. Plus we have great shows to spice up your conference dinners. When The Outwits host your conference, we become part of the team and get to know the guests. Our years of experience as professional improvisers mean that we can incorporate what we learn about you into the content of the show. "Fantastic Show. Couldn't believe how fast 40 mins went by. The Hausts seemed able to read the audience really well and had done their homework on the company so had everyone in fits of laughter from beginning to end. Our group has a large demographic of ages so quite often is hard to find something that will suit everyone but from the feedback the next day I would say that the Hausts cetainly managed it." Industry Management Systeme, Diane Mitchell. "They impressed the audience with their zany humour, but their ability to improvise comedy on the spot, out of nothing, was quite outstanding". "The guys were still raving on Sunday morning and today about your performance." "It really helped kick the day off. People had tears of laughter running down their faces." "Great effort, highly entertaining, thoroughly recommendable." "You made those of us organising the conference look fantastic!"